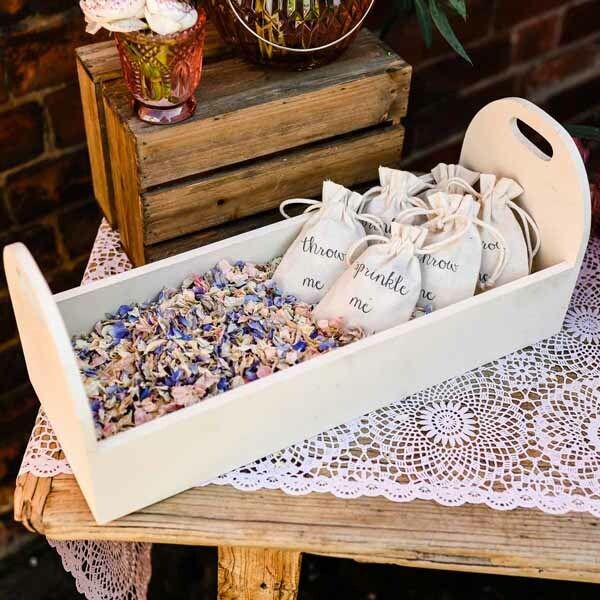 Are you using our natural biodegradable confetti petals for your wedding confetti? You’ve made a great choice if you are. 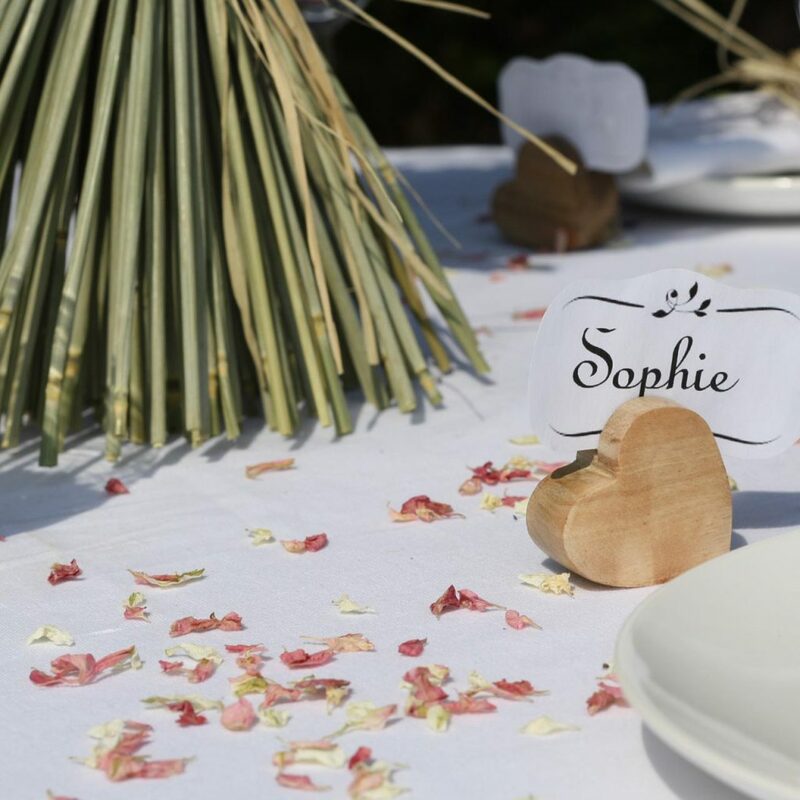 Our confetti petals come in 4 different colour ways to suit any style of wedding, ivory, blush pink, blue and summer mix (our favourite!). 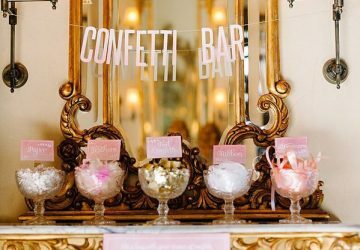 Read on to find out some of our frequently asked questions about buying real confetti petals for your wedding. 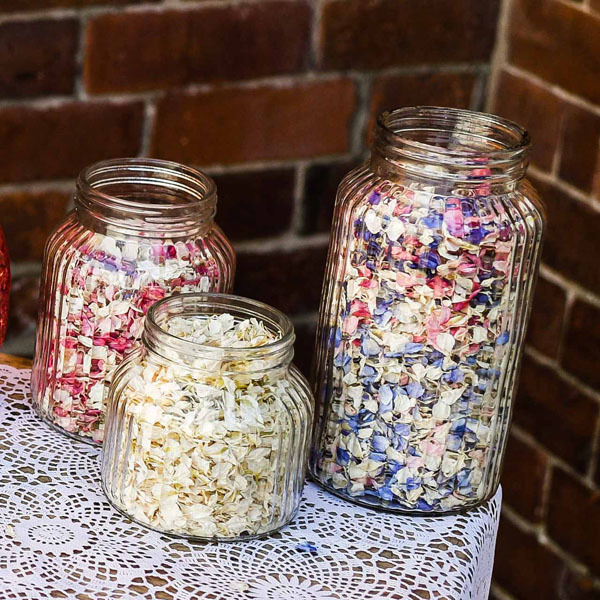 See our wedding petal confetti for sale here. Here we have answered some of your most common confetti petal questions. Yes! Our petals are 100% natural and biodegradable. Our petals all come from delphiniums which have been grown with love and care on a family farm. The petals are hand picked and packed with no artificial colourings added. My venue only allows natural petals. Are yours OK? Most venues and churches are perfectly happy with biodegradable petals. Our petals will biodegrade in a couple of days so the venue will not have to sweep them up. 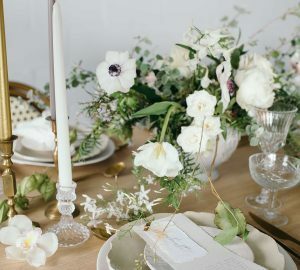 If petals are left scattered around your venue they act exactly the same as blossom falling from trees or petals falling from flowers and will biodegrade very quickly. When Should I Buy My Confetti? Our petals last for up to 1 year. 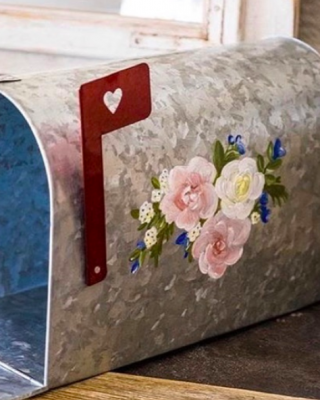 We suggest ordering 2 – 3 months before your wedding as they will keep so well, but don’t worry if you leave it until the last minute as we have a next day delivery option you can choose. 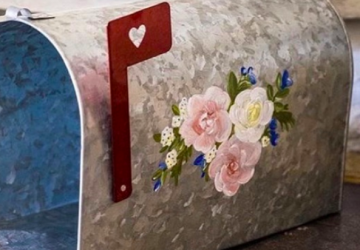 Once you receive the petals we suggest storing them in a cool dry place. We sell our petals by the handful to make it easy for you to calculate this. One handful will also fill one cone. Do I need to buy enough petals for everyone attending my wedding? This is completely up to you! You can buy enough for everyone if you wish, or just for half the number of guests as you may find couples only take one handful between them. Some guests may also bring their own confetti. 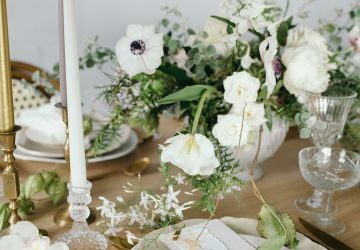 I’m sprinkling the petals over a table, how much should I buy? 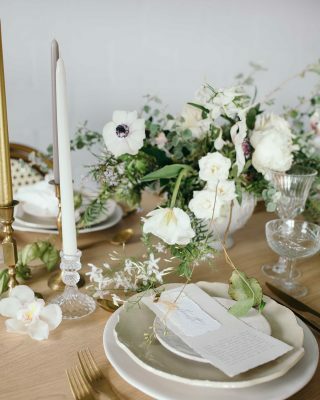 Our petals make a lovely table decoration, sprinkle one handful over each round table or trestle table. What do you suggest I present the petals in? 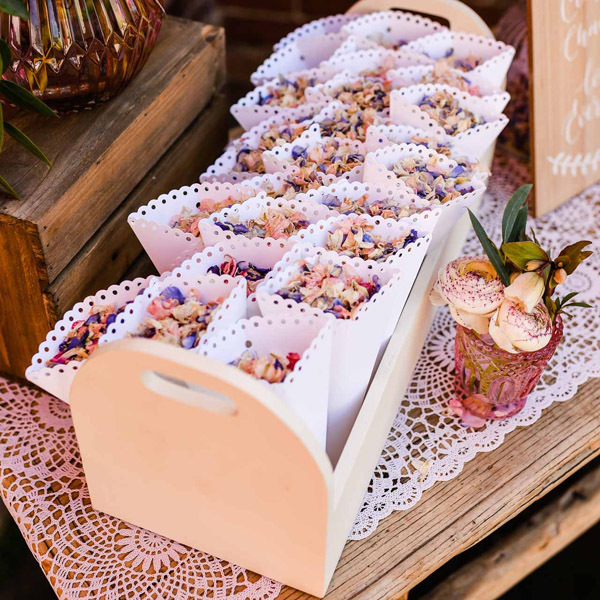 You can keep it simple and pour your petals into a basket or trug that is left at the back of the church for guests to help themselves. 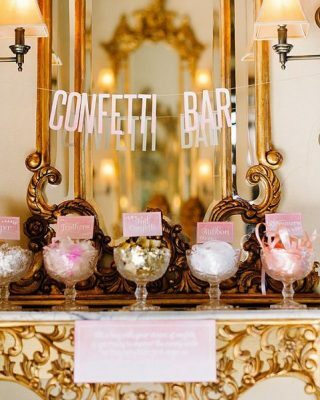 Display your confetti petals in paper cones for guests to have a cone each or cone between their family. 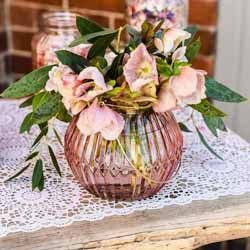 Alternatively display your confetti petals in glass jars, you could have a mix of different colours and guests could help themselves as to which colour they fancy. 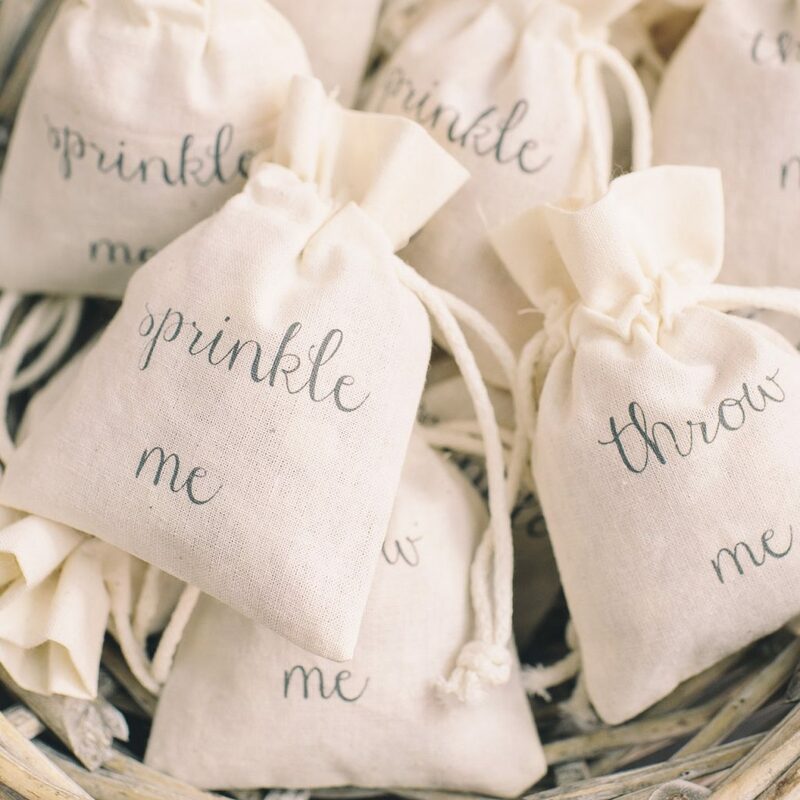 Our cotton confetti bags are also a popular choice, we have bags that read ‘sprinkle me‘ and ‘throw me‘ which is a lovely touch. Or how about pouring your petals into cones. Pop to the shop to see our natural confetti! Hello! 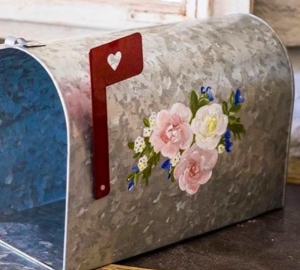 Do these petals stain if they get wet? Thank you!